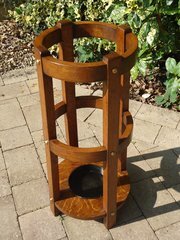 Stylish Arts & Crafts round stick stand in oak with brass studs. Possibly a design retailed by Liberty & Co. Offered in excellent condition having been stripped and refinished. Not sure whether the drip tray is original but fits perfectly. Height 74cms. Diameter at top 31cms. 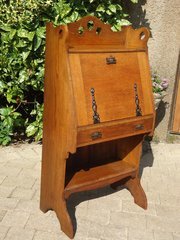 Pretty Arts & Crafts oak bureau with pierced hearts to gallery. Dainty strap decoration to fall front and handles with hearts. It retains its original ink well and key which works lock. Offered in good original condition with just one small ring mark to top as shown. Most probably retailed by Liberty & Co. Height 123cms. Width 65cms. Depth 38cms. Writing height when fall front in place 74cms. 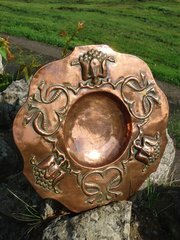 Arts & Crafts copper charger with a good deep well. Decorated with stylised seed heads. Good quality and heavy item. This measures 35cms in diameter and is 3cms deep. Offered in good condition. Unusual Arts & Crafts letter rack in oak with turquoise cabochons behind a decorative brass overlay. This measures 24cms high and 29cms wide. The depth is 12cms with two divides. Offered in good condition with a minor bruise to top. Lovely set of five Arts & Crafts tiles depicting three different images of water lilies. Possibly from a Victorian fireplace. Offered in good condition with just one minor nick. They measure six inches square. 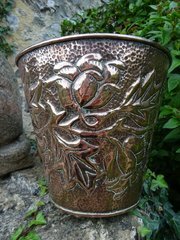 Unusual large Arts & Crafts copper jardiniere decorated with flowers and leaves and most probably the work of John Williams for Fivemiletown. Good heavy items measuring 22cms in height with a diameter at the top of 25cms. Great for a plant but could also serve as an ice bucket. A delightful pair of candlesticks designed by E.A.Jones. The base and sconce is made of copper with the centre pillar in oak turned in a barley twist manner. The y measure 18cms in height and have a diameter at base of 10cms. The mark to base reads winder ,Windermere. Offered in excellent condition. Possibly sliver plated when made? Pretty Arts & Crafts pewter fruit basket with pierced gallery after a design by Archibald KnoX and retailed by Liberty & Co. Stamped to base with number 01172. Offered in good condition with the handle just slightly misshapen. Height 19cms. Width 24cms. Depth 17cms.